After spending one Christmas with an overwhelmed 2-year-old, I vowed to limit the number of Christmas gifts that I give my kids. Isabelle literally ended up in tears because there were just too many things for her to deal with. Even though both she, now 16, and my five-year-old are past the “I’m losing it—this is too much!” reaction phase, I think that overwhelm is still something for kids and adults alike to avoid. If your Christmas is a frenzy of unwrapping, it doesn’t allow for time to savor the gift, genuinely think about the spirit that it was given in, express gratitude, and enjoy or play with it. I found that my kids get a lot of gifts even if I limit my choices because of from grandparents, my sister, and friends. If the shopping has already been done, perhaps consider giving some gifts on Christmas Eve or even the days before? Or maybe just plan to dial it down next year? A lot of families follow this formula or something similar, and some use it for the adults too. NQM Tip for kid’s ‘read gift‘, ‘need gift,’ and ‘wear gift‘: I LOVE (and I mean LOVE) the book “What Do You Do With An Idea?“ It is such a great thought-provoking book for kids (and for some adults too!). I gave the set of “What Do You Matters” books by Kobi Yamada to a friend this year and got raves. Reina’s also getting the North Face Mittens shown as her ‘need gift’ which might get eye rolls from some kids but since she’s super into playing outside in cold weather, she’ll actually love them. 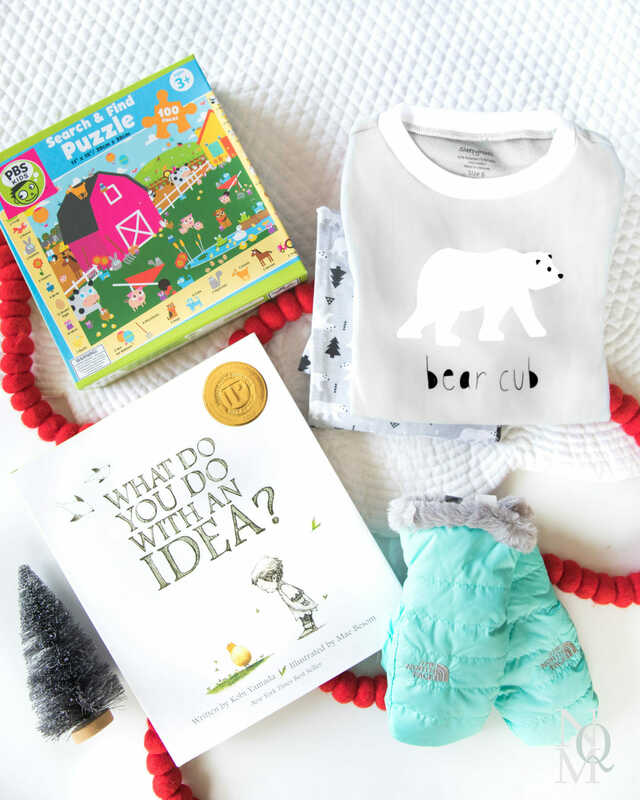 The Bear Cub pajamas for her ‘wear gift’ are so dang cute! They have matching adults versions too BTW. I’ve adopted the wear and read portions as a Christmas Eve present, and give PJs and a book to each child. I generally pre-wash the PJ ‘s so they can be worn that night, and be in Christmas morning photos. I give Reina 1 Christmas-themed book to add to our collection, but for older kids, I’d recommend opting for a heart-warming but not necessarily Christmas-themed book. Then on Christmas morning, they have a lot to unwrap in spite of our limit: stockings filled to overflow, something they want and something they need, plus the gifts from extended family and friends. For future years, I’d suggest you try the NQM gift-giving formula above. And if you’d like to give more than just those few, try our Advent tradition too. We like giving a mix of smaller and bigger as well as homemade and store-bought gifts so decided long ago to give Advent gifts. Advent allows us to give all the gifts we want but in a more gratitude-based, enjoyable way. They get a single gift a day starting December 1st which gives them time to appreciate it and enjoy it to the fullest before the next day’s gift. The other bonus to this is that even the small and inexpensive gifts are appreciated! If you do give the Advent option a try, don’t feel like all items need to be alike. Some days they get a tiny item like a single piece of candy, a Lego mini figure, or a card. Other days, it may be something more significant that they’ve been yearning for. Another idea is to give things for Advent that are experiences or items that can be played with ahead of Christmas (the one shown is sold out but this is a great get-delivered-on-time-for-Christmas option). We love playing games as a family so there are always a few games given which allows us to play them throughout the holiday season. We’ve given complicated jigsaw puzzles out early for the same reason too. And last but not least, experience gifts are fantastic as they end up being memories instead of items to outgrow. This year we went to a special Christmas festival in Seattle which was a blast and other years we went skiing. The skiing year also gave a reason to replace worn cold weather gear on the advent days that preceded the trip. No matter what your Christmas and gift-giving philosophy is, I hope you and your family have a wonderful holiday!